The HDMI to VGA HD HDTV BOX is a revolutionary product that allows you to use the full resolution (up to 1080p) of any HDMI device on a CRT projector, PC monitor, older HDTV/Plasma TV, or any other device without a HDMI input! If you own a high quality projector/monitor/TV that does not have a HDMI connector you need this device! The HDMI Converter HDMI to VGA HD HDTV BOX allows you easily add digital devices such as HD-DVD/Blu-Ray players, PS3, X360 Elite, Satellite/Cable HDTV set-top boxes & HTPCs with HDMI graphic cards, to name a few! 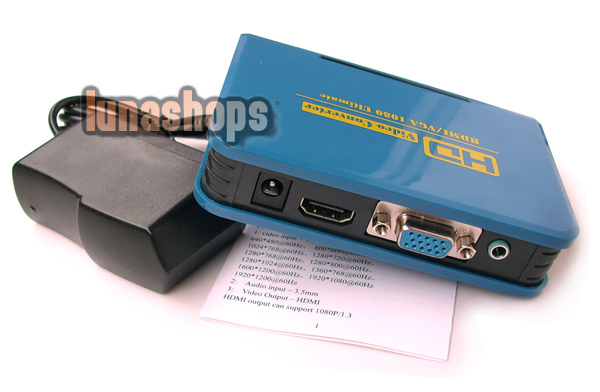 Simply connect the HDMI Converter HDMI to VGA HD HDTV BOX into your projector, your HDMI device into the HDMI Converter HDMI to VGA HD HDTV BOX, and be amazed by the difference ! 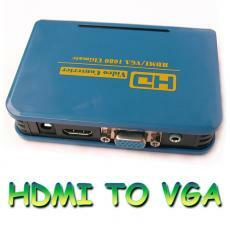 The HDMI Converter HDMI to VGA HD HDTV BOX delivers a razor sharp picture with absolutely NO video noise. The picture quality improvement as compared to RGBHV analog video is immediately obvious, providing an amazingly clear and detailed picture! 1. I have a CRT TV set which is have the YPbpr port, can i buy HDMI Converter? 2. 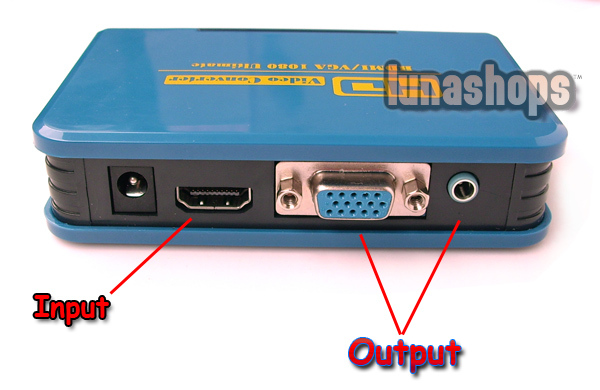 My projector is VGA port input, Can i use the HDMI Converter? 3. Can i get the sound divided from the HDMI Converter? Answer: Yes, you can. You can connect your speaker to the 3.5mm audio plug on the HDMI Converter.